Download "Agenda Item: 3.2.5.b. Prepared by: B. Skloss/V. 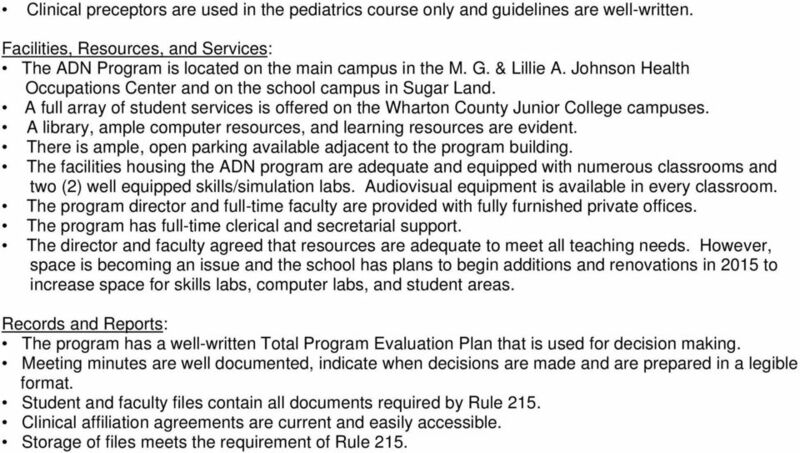 Ayars Board Meeting: July 2014"
1 Report of a Routine Survey Visit Wharton County Junior College, Wharton, Texas Associate Degree Nursing Education Program Agenda Item: b. Prepared by: B. Skloss/V. 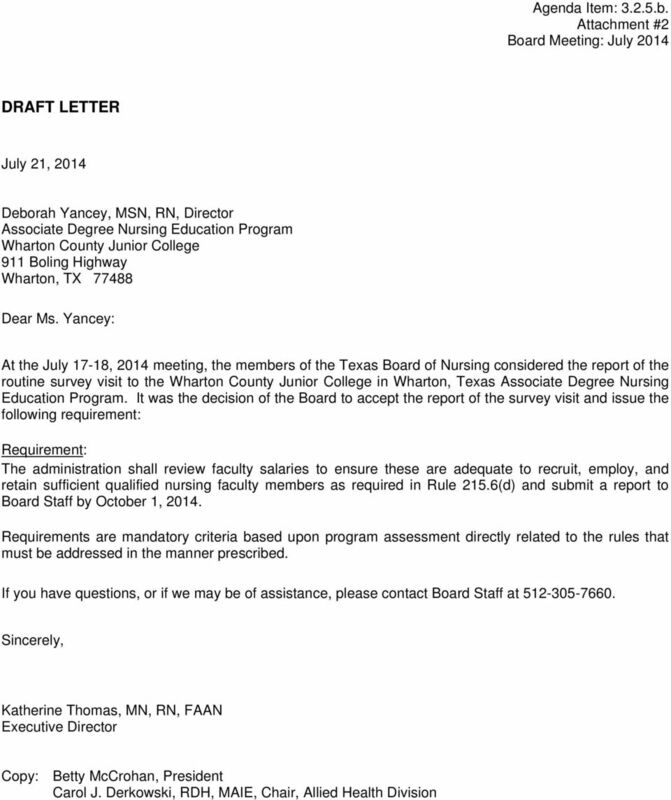 Ayars Board Meeting: July 2014 Summary of Request: Consider the report of the April 30, 2014, routine survey visit to the Wharton County Junior College in Wharton, Texas Associate Degree Nursing Education Program (See Attachment #1). The survey visit was conducted by Beverly Skloss, MSN, RN, Board Program Evaluator. A previous survey visit was conducted in March Historical Perspective: Wharton County Junior College (WCJC) was established in The college, accredited by the Southern Association of Colleges and Schools, has campuses in Wharton, Richmond, Palacios, Sugar Land, El Campo, and Bay City. The WCJC Associate Degree Nursing (ADN) Education Program began operation in 1981 and began offering the Licensed Vocational Nurse (LVN) to ADN Education Program track in Expansion to Sugar Land occurred in The ADN Education Program is located on the main campus in the M. G. & Lillie A. Johnson Health Occupations Center. The ADN program is part of the Division of Allied Health which also includes Vocational Nursing (VN), Dental Hygiene, Health Information Technology, Human Services Program, Physical Therapy Assistant, Radiology Technology, and Surgical Technology.. The NCLEX-RN pass rates for the past five (5) years are provided in the following table: Examination Year NCLEX-RN Examination Pass Rate Number of First Time Candidates (Passed/Total) % 47/51 Full % 50/53 Full % 26/30 Full % 34/35 Full % 47/48 Full BON Approval Status Deborah Yancey, MSN, RN, Program Director, has been in the nurse administrator position for five (5) years, having served as a faculty member for ten (10) years prior to her appointment as director. Five (5) full-time and four (4) adjunct faculty members teach in the ADN program. One full-time faculty position is currently open. Ms. Yancey is responsible for the ADN program and has teaching responsibilities. The program admits two (2) cohorts per year, one (1) in spring at the Sugar Land Campus and one (1) in fall at the Wharton Campus, with the enrollment number based on the number of qualified applicants. Summary of Survey Findings: The Board Program Evaluator identified many strengths of the program. Findings from the survey visit indicate the program is not in full compliance with Board Rule 215. Pros and Cons from Survey Visit: Pros The ADN Program Director is an experienced educator and is highly respected by administration, faculty, and students. 2 In interviews with the Board Program Evaluator, administration and faculty credited Ms. Yancey for her strong leadership in providing a high quality nursing education program. Administration expressed total support for the ADN program and stated that the nursing program adds value to the college and fulfills an ongoing need in the community. Faculty members appear to be a cohesive, dedicated group that voiced satisfaction with their roles. Students interviewed expressed a high degree of satisfaction with the program and stated they believe faculty members are committed to their success. The majority of ADN graduates plan to enroll in a baccalaureate degree nursing (BSN) education program. The curriculum is developed according to Board rules and the Differentiated Essential Competencies (DECs) (2010) objectives. The program of study incorporates creative methods for course delivery, including frequent communication with faculty, face-to-face instruction, student-centered learning activities, and the utilization of simulation. The new concept based curriculum design enhances program rigor and facilitates graduate articulation into a BSN program. All clinical learning experiences are faculty supervised, with direct-patient care in hands-on clinical settings. Preceptors are only utilized during the pediatrics course. The program utilizes simulation to prepare students for clinical practice and for remediation. The program has multiple contracts with clinical affiliating agencies that provide a wide variety of clinical learning experiences. Professional development for the director and faculty appear to be adequate. Cons The majority of faculty members have been teaching less than five (5) years; currently, one vacancy for a full-time faculty position exists. Faculty indicated they lack adequate time to fulfill the roles required of them due to the number of hours they are required to be in the skills/simulation lab and noted the need for a lab coordinator. No evidence was available that, upon enrollment, students receive written information about the Board s process of eligibility for licensure. Although identified during the survey visit, the program director addressed this concern prior to the end of the site visit. The director carries a teaching load of four (4) clock hours per week and faculty validated that she fulfills the role of extra teaching due to a high faculty turnover. The director and faculty members stated that retention is a problem due to low salaries at the college compared to salaries in other areas of nursing. 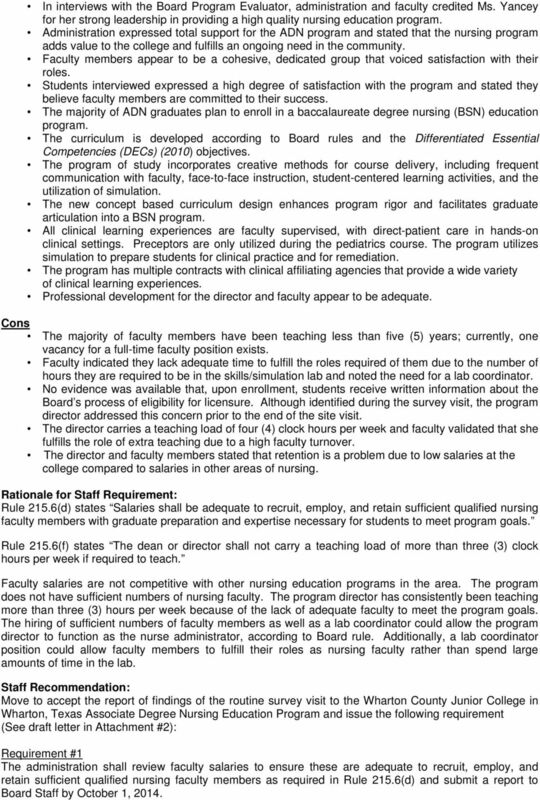 Rationale for Staff Requirement: Rule 215.6(d) states Salaries shall be adequate to recruit, employ, and retain sufficient qualified nursing faculty members with graduate preparation and expertise necessary for students to meet program goals. Rule 215.6(f) states The dean or director shall not carry a teaching load of more than three (3) clock hours per week if required to teach. Faculty salaries are not competitive with other nursing education programs in the area. 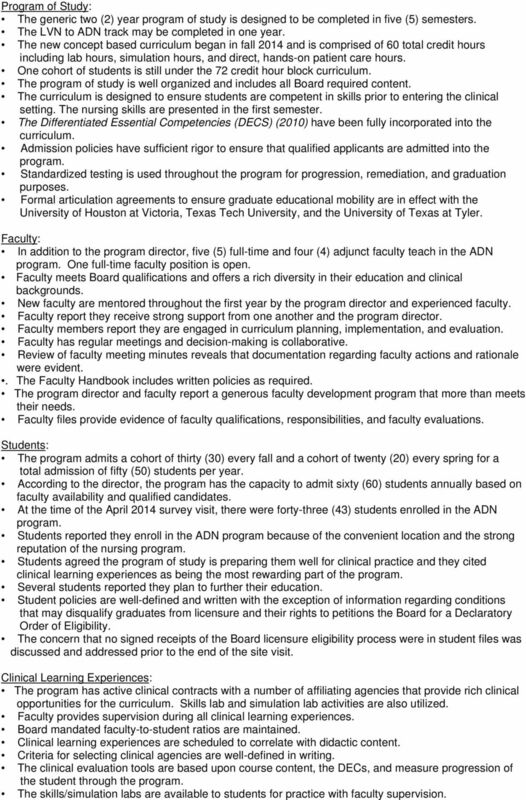 The program does not have sufficient numbers of nursing faculty. The program director has consistently been teaching more than three (3) hours per week because of the lack of adequate faculty to meet the program goals. The hiring of sufficient numbers of faculty members as well as a lab coordinator could allow the program director to function as the nurse administrator, according to Board rule. Additionally, a lab coordinator position could allow faculty members to fulfill their roles as nursing faculty rather than spend large amounts of time in the lab. Staff Recommendation: Move to accept the report of findings of the routine survey visit to the Wharton County Junior College in Wharton, Texas Associate Degree Nursing Education Program and issue the following requirement (See draft letter in Attachment #2): Requirement #1 The administration shall review faculty salaries to ensure these are adequate to recruit, employ, and retain sufficient qualified nursing faculty members as required in Rule 215.6(d) and submit a report to Board Staff by October 1, 2014. 3 Agenda Item: b. Attachment #1 Board Meeting: July 2014 Summary of Survey Visit Wharton County Junior College, Wharton, Texas Associate Degree Nursing Education Program Purpose of Survey visit: Routine survey visit Date of Visit: April 30, 2014 Program Evaluator Conducting Visit: Beverly Skloss, MSN, RN, Contracted Program Evaluator Program Evaluator met with: Leigh Ann Collins, Vice President of Instruction Amy LaPan, MSW, PhD, Dean of Vocational Instruction Carol J. Derkowski, RDH, MAIE, Chair, Allied Health Division Deborah Yancey, MSN, RN, Associate Degree Nursing (ADN) Education Program Director Charlet Jose, MSN, RN, OCN, Faculty Patricia Korenek, MS, RN, WHNP, Faculty Amy Pendergraft, MSN, RN, Faculty Mariakutty Samuel, MSN, RN, Faculty Corrine Smith, MS, RN, ANP-C, Faculty Cynthia Cruz, MSN, RN, Faculty Sharon Rappold, MSN, RN, Faculty Four (4) ADN Students Activities carried out by Program Evaluator during survey visit: Reviewed the curriculum and all syllabi; Reviewed the Student Handbook and Faculty Handbook; Reviewed exams and clinical evaluation tools; Toured campus and facilities housing the nursing program; Interviewed four (4) students; Held initial conference with director and administration; Met with faculty members; Reviewed records and documents including: student and faculty files, minutes of faculty meetings, and the Total Program Evaluation (TPE) Plan; and Conducted exit interview with director and administration. Summary of Findings: Administration: Administration indicated the ADN program adds value to the college and continues to fulfill a need in the local community. The ADN program is in the Division of Allied Health that also includes Vocational Nursing (VN), Dental Hygiene, Health Information Technology, Human Services Program, Physical Therapy Assistant, Radiology Technology, and Surgical Technology. Deborah Yancey, MSN, RN, Program Director, has been the director of the ADN Program since Ms. Yancey reported that she is comfortable fulfilling her program director duties as well as carrying a regular teaching load because she was previously faculty for the program and because of dedicated faculty and strong administrative support. Clear channels of communication between the director and administration were evident. According to the Vice-President of Instruction, the Division Chair and the ADN Program Director, ADN graduates are able to obtain employment in affiliating clinical agencies as well as in the Houston area. The director carries a teaching load of four (4) clock hours per week due to faculty turnover. 4 Program of Study: The generic two (2) year program of study is designed to be completed in five (5) semesters. The LVN to ADN track may be completed in one year. The new concept based curriculum began in fall 2014 and is comprised of 60 total credit hours including lab hours, simulation hours, and direct, hands-on patient care hours. One cohort of students is still under the 72 credit hour block curriculum. The program of study is well organized and includes all Board required content. The curriculum is designed to ensure students are competent in skills prior to entering the clinical setting. The nursing skills are presented in the first semester. The Differentiated Essential Competencies (DECS) (2010) have been fully incorporated into the curriculum. Admission policies have sufficient rigor to ensure that qualified applicants are admitted into the program. Standardized testing is used throughout the program for progression, remediation, and graduation purposes. Formal articulation agreements to ensure graduate educational mobility are in effect with the University of Houston at Victoria, Texas Tech University, and the University of Texas at Tyler. Faculty: In addition to the program director, five (5) full-time and four (4) adjunct faculty teach in the ADN program. One full-time faculty position is open. Faculty meets Board qualifications and offers a rich diversity in their education and clinical backgrounds. New faculty are mentored throughout the first year by the program director and experienced faculty. Faculty report they receive strong support from one another and the program director. Faculty members report they are engaged in curriculum planning, implementation, and evaluation. Faculty has regular meetings and decision-making is collaborative. Review of faculty meeting minutes reveals that documentation regarding faculty actions and rationale were evident.. The Faculty Handbook includes written policies as required. The program director and faculty report a generous faculty development program that more than meets their needs. Faculty files provide evidence of faculty qualifications, responsibilities, and faculty evaluations. Students: The program admits a cohort of thirty (30) every fall and a cohort of twenty (20) every spring for a total admission of fifty (50) students per year. According to the director, the program has the capacity to admit sixty (60) students annually based on faculty availability and qualified candidates. 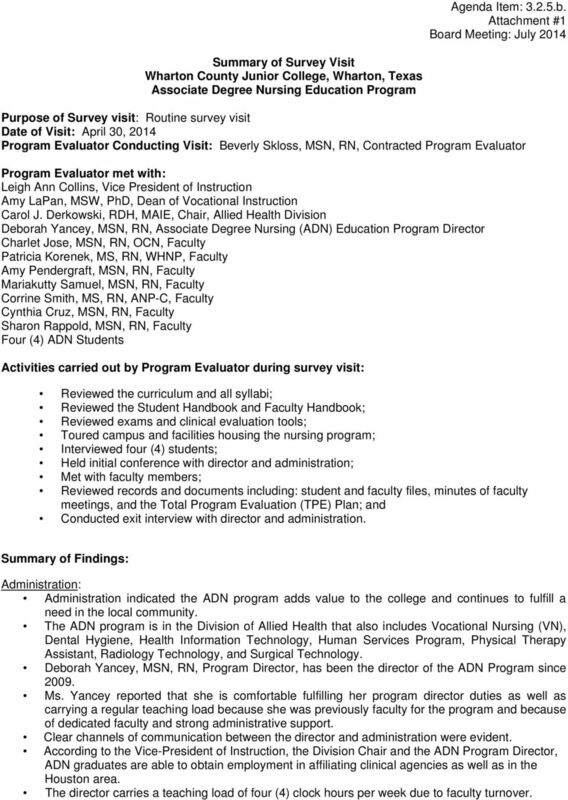 At the time of the April 2014 survey visit, there were forty-three (43) students enrolled in the ADN program. Students reported they enroll in the ADN program because of the convenient location and the strong reputation of the nursing program. Students agreed the program of study is preparing them well for clinical practice and they cited clinical learning experiences as being the most rewarding part of the program. Several students reported they plan to further their education. Student policies are well-defined and written with the exception of information regarding conditions that may disqualify graduates from licensure and their rights to petitions the Board for a Declaratory Order of Eligibility. The concern that no signed receipts of the Board licensure eligibility process were in student files was discussed and addressed prior to the end of the site visit. Clinical Learning Experiences: The program has active clinical contracts with a number of affiliating agencies that provide rich clinical opportunities for the curriculum. Skills lab and simulation lab activities are also utilized. Faculty provides supervision during all clinical learning experiences. Board mandated faculty-to-student ratios are maintained. Clinical learning experiences are scheduled to correlate with didactic content. Criteria for selecting clinical agencies are well-defined in writing. The clinical evaluation tools are based upon course content, the DECs, and measure progression of the student through the program. The skills/simulation labs are available to students for practice with faculty supervision. 5 Clinical preceptors are used in the pediatrics course only and guidelines are well-written. Facilities, Resources, and Services: The ADN Program is located on the main campus in the M. G. & Lillie A. Johnson Health Occupations Center and on the school campus in Sugar Land. A full array of student services is offered on the Wharton County Junior College campuses. A library, ample computer resources, and learning resources are evident. There is ample, open parking available adjacent to the program building. The facilities housing the ADN program are adequate and equipped with numerous classrooms and two (2) well equipped skills/simulation labs. Audiovisual equipment is available in every classroom. The program director and full-time faculty are provided with fully furnished private offices. The program has full-time clerical and secretarial support. The director and faculty agreed that resources are adequate to meet all teaching needs. However, space is becoming an issue and the school has plans to begin additions and renovations in 2015 to increase space for skills labs, computer labs, and student areas. Records and Reports: The program has a well-written Total Program Evaluation Plan that is used for decision making. Meeting minutes are well documented, indicate when decisions are made and are prepared in a legible format. Student and faculty files contain all documents required by Rule 215. Clinical affiliation agreements are current and easily accessible. Storage of files meets the requirement of Rule 215. 4. Appendices - supplemental information that supports the documentation related to the standards provided in the report. 16.12.3.3 STATUTORY AUTHORITY: Nursing Practice Act, Section 61-3-26 NMSA 1978 Comp. [1-1-98; 16.12.3.3 NMAC - Rn, 16 NMAC 12.3. Item #15 January 27, 2009 NURSING SCHOOL GRANT PROGRAM FISCAL YEAR 2009 AWARD ALLOCATION Submitted for: Action. Summary: This item presents recommended grant awards under the Nursing School Grant Program. 1. Overview Provide a one paragraph description of the proposed program. Be specific about what degree, major, minor or option is sought. Bylaws of the Nursing Program Approved December 15, 2008 Updated September 4, 2009 I. Unit Definition (size disciples, majors, etc) The Nursing program comprises the faculty appointed in the area of Nursing. ARTICULATION AGREEMENT Associate of Science: Nursing and Bachelor of Science in Health Systems Management Entered into this day of, 2007. (date) (month) Robert L. Bogomolny President Martha A. Smith, Ph.D. This standard is 100% met for the baccalaureate program. This standard is 100% met for the master s program.